Pakistan celebrated the return of international cricket to their country with a 2-1 win over the World XI in the three-match T20I series at the Gaddafi Stadium in Lahore on Friday. Pakistan won the third and final T20 game against the Faf du Plessis-led World XI side by 33 runs to clinch the Independence Cup. Pakistan had won the first match by 20 runs on Tuesday in Lahore. The World XI levelled the series next day with a seven-wicket win on the same ground. On Friday, the World XI, chasing a target of 184, never got going as they could manage to score only 150/8 in their 20 overs. 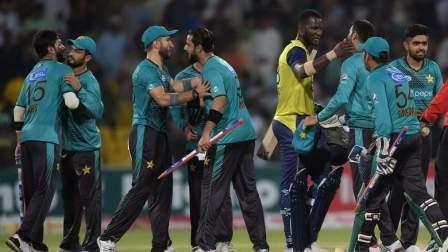 South African all-rounder David Miller (32, 29 balls) and Sri Lankan Thisara Perera (32, 13 balls) fought hard, but their efforts were not enough to stop Pakistan from lifting the trophy. Earlier, Pakistan, sent into bat by the World XI, scored 183-4. Opener Ahmed Shehzad missed his second Twenty20 international century when he fell for 89. His 55-ball knock included eight boundaries and three sixes. Babar Azam made a 31-ball 48 with five boundaries and added 102 for the second wicket with Shehzad. Meanwhile, former New Zealand batsman Grant Elliott, part of the World XI squad on Pakistan tour, on Friday said that the security arrangement is "amazing" and hoped to see the return of Test cricket to the country. "My experience here has been great so far. The security is amazing. All of us (players) feel secure," Elliot was quoted as saying by Geo News ahead of the final T20 match of the Independence Cup. "When we go from the ground to the hotel, it's as safe as any other country. It's the only (cricket-playing) country I hadn't been to, but now I can say I've played cricket in Pakistan. "It is great. The hospitality, the support from the crowds at the ground. It's nice to be here," he added. The former Kiwi all-rounder expected more international teams to travel to Pakistan if proper security arrangements are kept in place. "If security plans stay as good as this, other teams will also come here. Hopefully, Pakistan will play Test cricket at home again. It will be good for the children to see their heroes play," he hoped.